A dark exterior suggests a volcano of energy, its inherent beauty and mystery highlighting the interior mosaic of pastel eggshells. 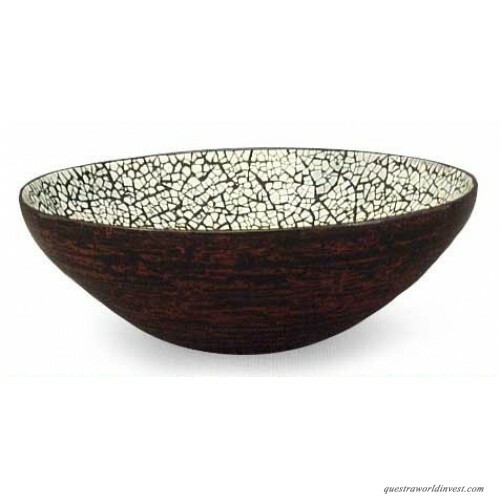 Presented by Daeng Thanunchai, this hand-crafted bowl makes a daring accent to any ambiance. For decorative purposes only. To complete this piece, coiled bamboo basketry is carved into the desired shape on a lathe. A mixture of lacquer, obtained from the Gluta Tacitus tree and ashes of burnt rice paddy husks is then applied to the object. Upon exposure to air, the mixture dries to form a watertight seal that is polished before another coat is applied. This process is repeated until a rigid base is formed, and a final polishing is executed with sandpaper. Then several coats of pure lacquer are painted on the object, with drying periods in between each coat. Next, chicken and duck eggshells are thoroughly cleaned and spread out on paper towels to dry. 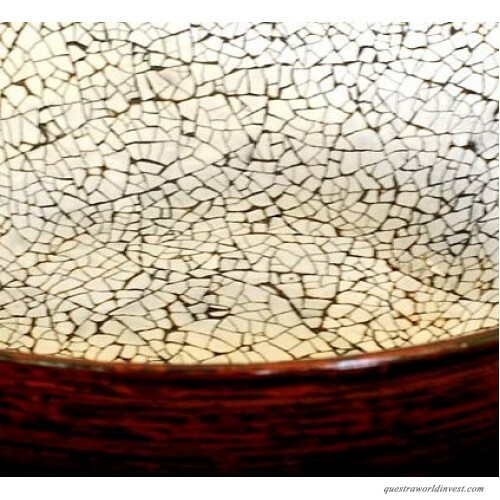 Once dry, they are cracked into small pieces and arranged in a mosaic pattern. Then lacquer is once again applied to the piece and the shells are placed onto this fresh coat. 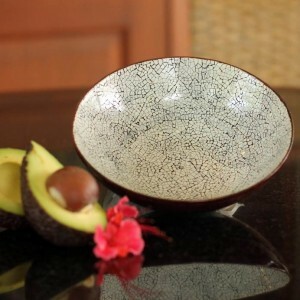 The work is then lacquered twice, and once the lacquer is dry it is sanded in water until the eggshells slowly appear. The piece is finally washed with water and polished with powdered fired clay, resulting in an alluring gleam.